Stickman Soccer 2018 is the latest entry in Stickman Soccer game series. It has just released for mobile devices on Google Play Store and other mobile stores. The latest expansion comes with amazing graphics, lots of game modes, and a better gameplay that lets you enjoy a true soccer game experience on your mobile screen. In this post, we have covered everything about the game you need to know: Stickman Soccer 2018 guide and Stickman Soccer tips, cheats & strategy to build the best soccer team with best players. Before we dive into the cheats, tips, strategy and guide part, let’s learn the basic aspects of the game. At the beginning of the game, you have default players(no skill, no extra speed). The player can buy players in exchange for coins. There are many ways to earn free coins in Stickman Soccer 2018 game. However, for a huge grab, you need to win matches. We have added cheats, tips below for those who are having trouble winning matches. 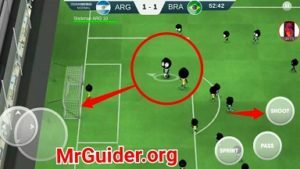 Let’s start the Stickman Soccer guide and after it, check out Stickman Soccer tips, cheats & strategy guide to win matches. As stated above, Stickman Soccer 2018 game features lots of game modes; all the game modes are unlocked; you are free to choose anyone anytime. Daily Event -> You can participate in daily events and earn 5X coins by winning the matches. However, to play this mode, you have to pay coins. The cost of entry fee varies; for normal, you have to pay 100 coins. And for the national event, you have to pay more. League -> In this mode, you choose one of your favorite soccer team and play against other teams to top the leaderboard. You have to win rounds and top the leaderboard to get a huge amount of coins. League mode is one of the best modes to get free coins in bulk. Along with coins, you will also get a huge amount of EXP(Required to level up). Quick Game -> In quick mode, you choose one of your favorites team and match against other teams for coins. The amount of reward varies; the better your opponent the more prize money. 2-Player Mode -> There is also 2-player mode available; all you need to do is connect the controller and then play against each other. Go to the quick mode -> tap on the controller/game-pad icon at the top-right -> confirm. Before you start the match in these modes, you can choose the difficulty level; easy, normal, difficult, and pro. And you can also choose the match time; 2 MIN, 4 MIN, 6 MIN, 8 MIN, 16 MIN. The amount of reward varies as per your difficulty; if you play with easy mode, the amount of reward will be less. As stated above, In Stickman Soccer 2018, at the beginning of the game, you have default players and they are not too good; 0 skill, 0 speed. You can buy premium players in exchange for coins and build the best soccer team. By building the team of professional players, you can easily win the matches. How? Go to the main screen/lobby. Tap on the team manager. At the left side, you can check the player details and at the right side, you can see the formation. Tap on a player card(i.e. goalkeeper) to check the replacement or upgraded player; buy it if you have coins. Make sure to edit the team and choose the favorite one, and then edit players. Go to the shop section of the Stickman Soccer 2018 game and from there you can buy player packs in exchange for coins or cash. And building a better team is one of the important tasks in Stickman Soccer 2018 game because the default stickman players are not too good. So, this is the basic Stickman Soccer 2018 guide for the beginners. Now, let’s learn Stickman Soccer 2018 tips, cheats & a strategy guide to win matches. If you don’t want to lose the ball from your grip, pass the ball accurately. If an enemy is following you continuously, use the sprint option and get rid of it. Then pass the ball to another team player and again use the sprint mode(don’t let them steal the ball). Play “league or “season” mode to earn a huge amount of coins. Use these coins and buy premium players. Go to the team manager and deploy the premium players; it would be better to buy the players from team manager section if you are stick to only one team. Buy the striker pack to get brilliant players; +speed, +shoot, +skill(recommended). Just win a league and claim thousands of coins.